Light Tackle Fishing In the Backwater, Inlet, or Ocean Aboard Hang-On! a new 2019 26' Pathfinder Tower Boat. Spanish and King Mackerel, Speckled and Gray Trout, Red and Black Drum, Cobia, Bluefish, Flounder, False Albacore and More! Experience a trip on one of the most versatile boats made for shallow water and the ocean. 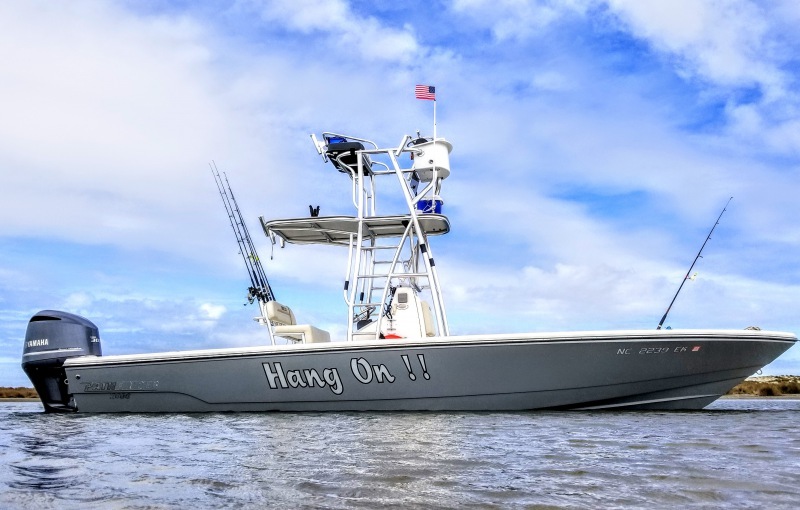 Florida built Pathfinder with its 300 Horsepower Yamaha will get you to the fishing grounds quickly, and the Captain's Tower will assure you the best possible chance for sight-casting the "Big One"! The Boat is equipped with Coast Guard Approved Safety Equipment, Modern Electronics, Two Live-Bait Wells, and an Engine Jackplate for Speedy Rides through very Shallow Water. Fish-Food-Drink Storage, all necessary Fishing Tackle, and a Little Shade are provided. Your saltwater fishing license is included at no extra charge! Trips will cover the waters near Hatteras Inlet on the Pamlico Sound and the Ocean Side (calm days) and may span toward the North as far as the town of Buxton and to the South near Mid-Ocracoke Island. When appropriate, emphasis will be placed on Sight-Casting Artificial Lures to surfacing fish, as well as In-The-Blind Casting where certain species of fish are likely to congregate.